There really is only one answer: THE FOOD! We have no desire to be ground breaking, to reinvent what took centuries to perfect, or to be part of some trendy food movement. 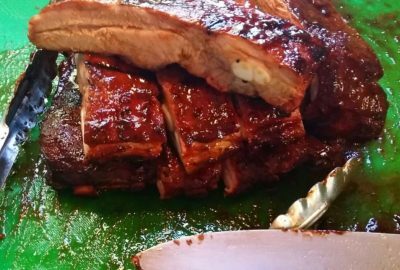 We are driven by a desire to make the best traditional american BBQ that you have ever had, provide customer service that has no equal and to be held as the standard by which you judge all other BBQ joints. Named after our beautiful kitchen on wheels, it packs in all your favorites into one, easy to eat on-the-go package! Baked Meaty Beans, Papa Pump’s Pulled Pork, and our amazing “Slap Yo’ Mama” Mac&Cheese all in a Chinese take out container! 3 cheese blend, cavatappi pasta, and some secret spices make this mac and cheese our most popular side item!